On March 17, ECOs Adam Johnson, Jason Smith, and Lucas Palmateer conducted a plainclothes detail targeting striped bass fishing violations in Rockland County. 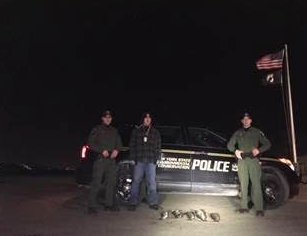 At Haverstraw Beach State Park, ECOs Smith and Palmateer stopped two men in possession of three striped bass. One man was issued a ticket for taking striped bass out of season. ECO Johnson observed another subject catch a striped bass and hide it in the woods. When the ECOs approached the man, they found the fish hidden in a bag under a log. The subject was also issued a ticket for taking striped bass out of season. The ECOs moved to the Piermont Pier and again watched as one subject caught a striped bass and put it in a bucket in his car. A second subject hid a striped bass in a bag under a rock wall. Both subjects were issued tickets for taking striped bass out of season and failing to possess a marine registry. At Lents Cove Park, ECOs Aaron Bonilla and Charles Eyler III observed a fisherman catch a striped bass. When the ECOs approached, the fisherman quickly threw his striped bass into the river. Another fisherman nearby attempted to throw his fish into the water but it came up short, landing on the rocky shore. ECOs also checked a cooler in the area that contained an additional illegal striped bass. A total of three striped bass were seized and six tickets issued for various fishing violations. All tickets are returnable to the Village of Buchanan Court in April.